Most golf instruction books are written by famous performers about how they personally swing the club, and there's no doubt the better ones can be helpful-especially if you share the authors's athleticism, ambition, appetite for work, and opportunities for practice and play. 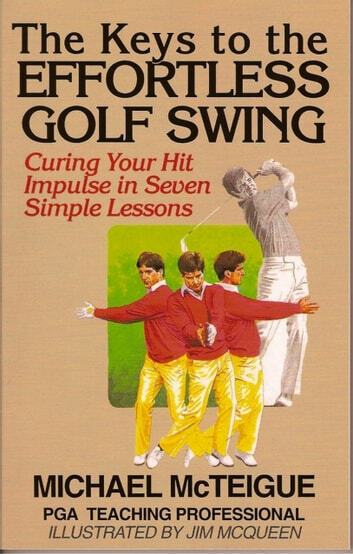 This book was written by a very bright but at the time unfamous young teacher whose daily bread depended on delivering permanently decent-to-good golf games to averagly endowed people with no interest in becoming slaves to the sport. He became so successful at that in his immediate community that his pupils demanded he put the system on paper for their constant reference and reminder. He called the result The Keys to the Effortless Golf Swing, and sent it to a number of star players, one of whom passed it on to me. After one quick reading I believed that the book would help so many other existing and would-be golfers to such an extent that it just had to be made available nationally. Jim McQueen, one of the world's top golf artists and a former professional, fully shared those sentiments and agreed to do the illustrations, and the nation's leading golf book publisher became an enthusiastic third party. 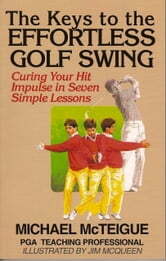 The key to Michael McTeigue's success with his thousands of pupils af all sizes, shapes, ages and ability levels in California, and the beauty of this book, is the clarity and simplicity and the supremely logical sequentiality of its approach to the golf swing. Follow the easily mastered steps or Keys in the recommended order and with a reasonable degree of patience, and in a remarkably short time, you will be experiencing entirely new sensations of both accurate striking and effortless power. Encouraged by those - and the accompanying evaporation of confusion - you will persist with these simple and clear cut moves until they become thoroughly muscle-memorized. At that point, you will be swinging the golf club effectively and with total confidence on every shot entirely by feel, which is the closest you or anyone else will ever come to golf's secret (ask any champion if you doubt that). Gone forever at long last will be the Band-Aids and the gimmicks and all that frustrating stumbling from one fruitless theory to another. If you love golf and want to play better for a lot less effort, then forget Michael McTeigue's fame quotient and work with this little gem of a book. It could make you as big a fan of his as all those happy pupils for whom he originally wrote it. --Ken Bowden. A former editorial director of Golf Digest magazine, Ken Bowden has coauthored more than a dozen golf instrunction books, seven of them with Jack Nicklaus. Be The Best Golfer…Even When You’re 60 & Over!